I have to be honest: I don't skate, and not since Tony Hawk's Pro Skater 3 have I played a skateboarding game. That said, I've never been opposed to them...but let's face it: I just don't have the patience anymore. Team Up. Throw Down. That's the tagline for Skate 3, and it's perfect. 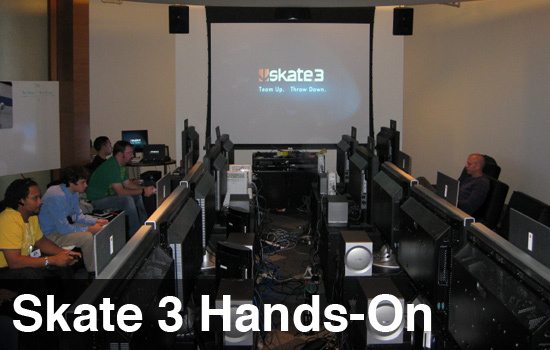 Through and through, Skate 3 is a team-based competitive game with the Freeskate co-op mode from Skate 2 thrown in. It's not a huge departure from the previous title in terms of actual gameplay and game modes, but where Black Box has decided to simplify some aspects (such as turning down the intensity of sidewalk cops in single-player and Freeskate) they've created the additional challenge of absolutely requiring teamwork in order to excel. Anyone can roam in Freeskate mode -- the functions and feeling of which are very reminiscent of Burnout: Paradise's Freeburn online mode -- and the host can initiate a new team challenge at any time. There were a dozen community members present, and about half were familiar with the controls; the rest of us learned on-the-go. 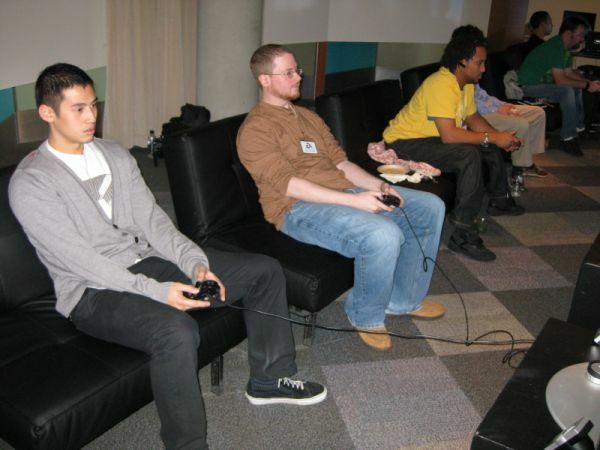 Jason and I found ourselves stationed across from each other (on competing teams) at Xbox 360 consoles. For the record: we agreed that while we preferred the Xbox 360 controls, the PlayStation 3 versions looked slightly better - it seemed like the lighting was softer...had a nice bloom to it. Both were very detailed, however, and the physics are top notch. We were told that some of the animations were improved from the last two games -- especially when your character steps/falls/stumbles off of the skateboard -- and while I couldn't directly compare them, I was plenty impressed. As far as visuals go, I really liked how the board reacts realistically to different skating surfaces, and the rider reacts to the board's movements. Rail slides and grinds are a real treat. Apparently, there's a good reason why Skate positions the camera low and behind. We started off with the basics. The controls follow suit with the last couple of years' worth of EA Sports games, trading out button smashing for analog stick control. Once you get up to speed using the face buttons, ollies and midair maneuvers are executed with the right stick and directional control with the left. Triggers are used for grabs. Three new tricks have been added: the Underflip, the Dark Catch, and the Dark Slide. As I understand it, each are basically reverse variants of the (respectively) Kickflip, Grab, and Slide. 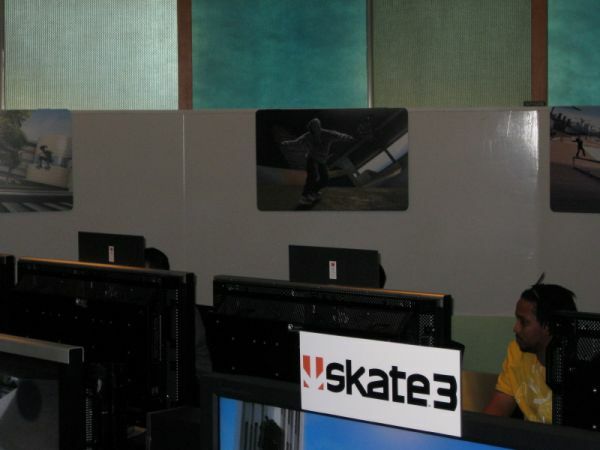 EA Community Manager Ron Yatco and Jason stretch out with some Freeskate. Once the basic tricks and trick chains were nailed down, we were given free reign to explore two of the three major areas. Most of us gravitated toward a large shark statue, where we were encouraged to "jump the shark"...this will apparently be an in-game challenge in a later build, but for now we were simply skating for our own enjoyment. "Jumping the shark" consisted of pushing off of a balcony onto a Y-shaped ramp that resembled a ski jump and culminated in the shark statue. A down-ramp on the opposite side caught your fall and ended whatever trick you were performing, unless you were slick enough to catch a board slide on the edge of the ramp, or nailed a trick off of the statue itself (which Jason did more than once). A trademark of the entire series is a "session marker" function which essentially lets you respawn at will, wherever you set a marker. This is invaluable when attempting tricks from places that are tedious to get to. 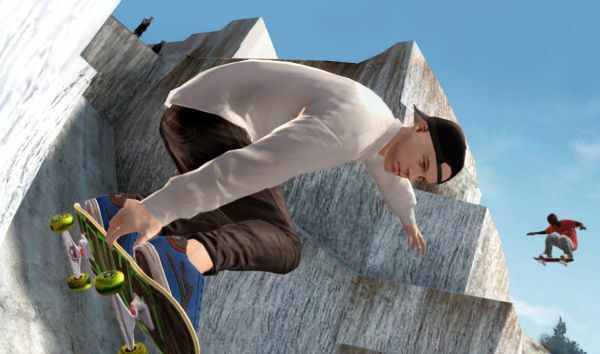 Skate 3 encompasses three large areas in an entirely new city, called Port Carverton. The areas are: Downtown, University, and Industrial zone. We were able to check out large portions - but not all - of the University and Downtown areas. There are tons of edges and sloped spots for trick riding, and you can even customize the area by dropping items - like benches, wood ramps, etc - wherever you fancy. Page created in 0.2697 seconds.